Hi friends! Hope you all had a fantastic weekend. Thanks for all the nice comments on my Eileen Hull project. 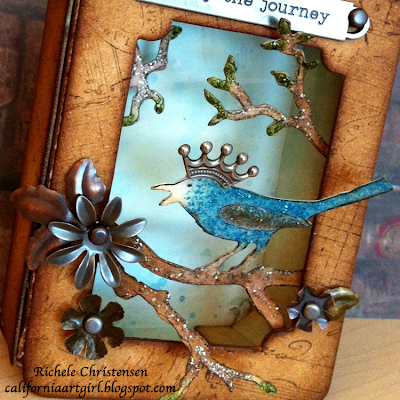 I love her creativity and I have so many more ideas for that little suitcase die! Today I want to share this Hello card. 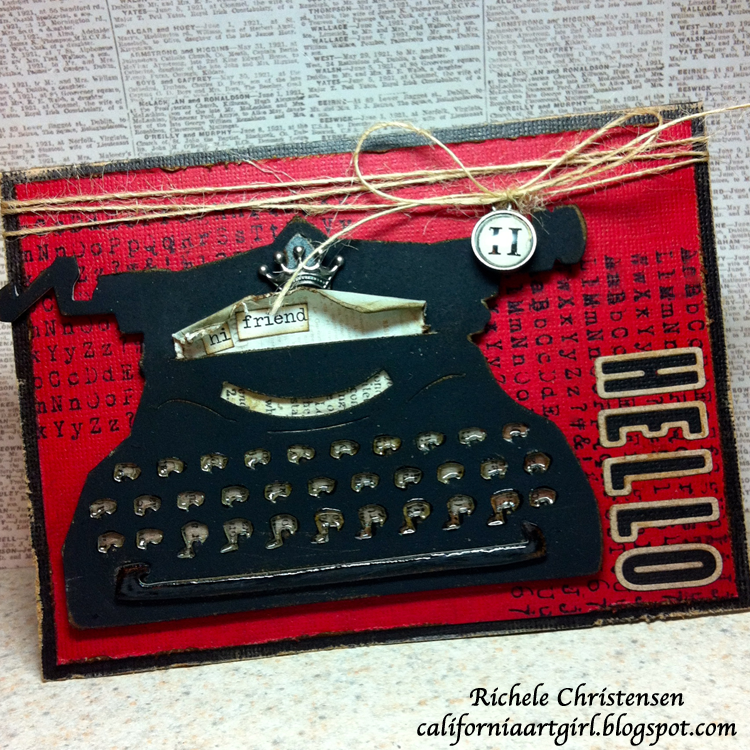 To get started die cut the Vintage Typewriter, a Bigz die from the Alterations line, using grunge board and then paint with Black Dabber Paint. The card is from Kraft'Core, a black base card and a red matt. 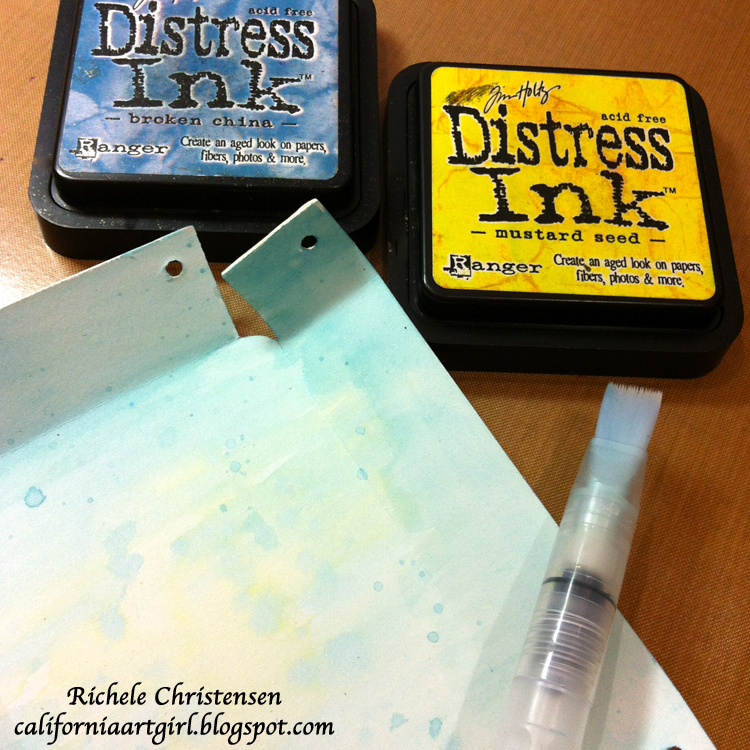 Use a Paper Distresser on the edges and then ink them with Vintage Photo Distress Ink on an Ink Blending Tool. I stamped the letters in the background with the School Desk set #57 from Stampers Anonymous with Jet Black Archival Ink. Now for the Typewriter, adhere a piece of dictionary print behind the keys. 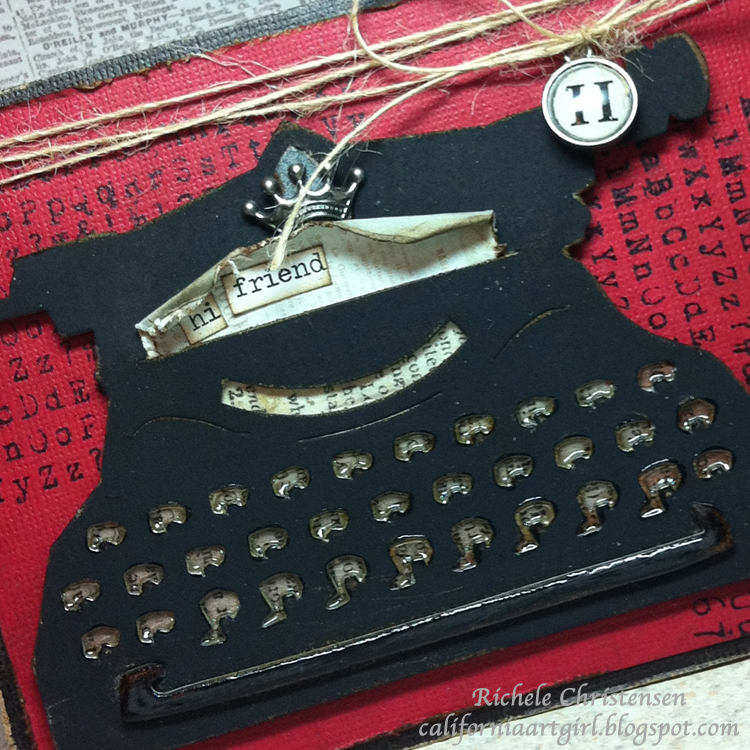 Add a little piece of paper coming out of the top of the typewriter and add a little message "hi friend" using some Chit Chat words. Pop dot the Typewriter to the card. Add Glossy Accents to the keys and space bar of the typewriter. Let dry. 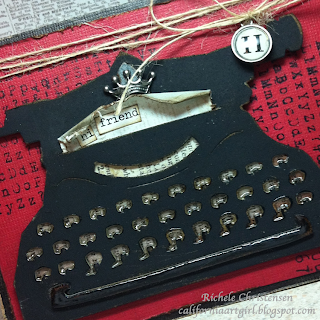 For a Royal Typewriter I bent my Crown charm with pliers and adhered to the top of the machine. Wrap twine across the top of the card and tie with a bow, don't forget the Type Charm. 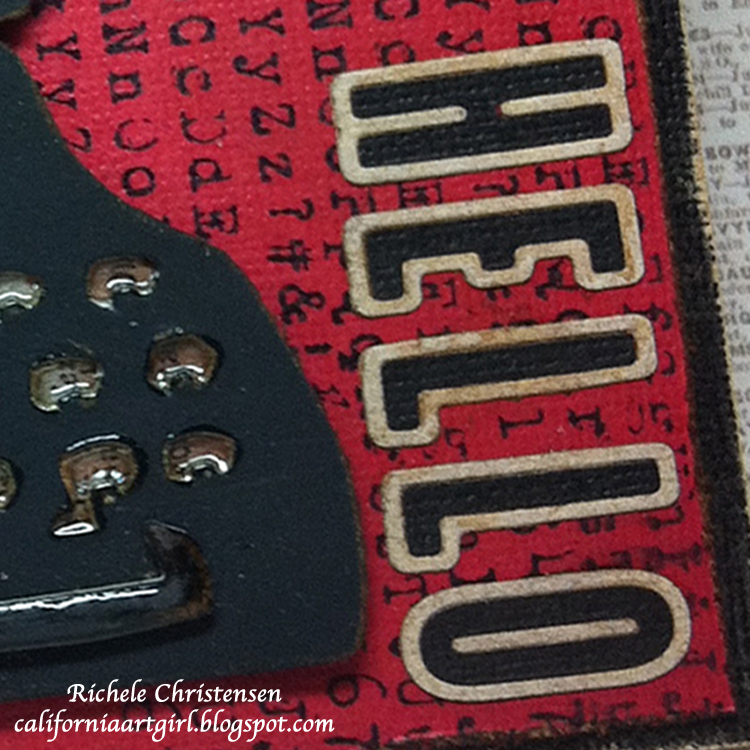 The "Hello" is die cut from Kraft'Core using the Inside Out Sizzlit Decorative Strip also from the Alterations line. I used two colors then adhere the letters to the card. If you like a Vintage look you may also like the Fan, Phone, Globe, Camera or Clock. All these come in a mini version in the Movers and Shapers dies too. Which die is your favorite? I'm so excited to be a part of the special Eileen Hull weekend giveaway over on the Sizzix blog. I love the creativity and innovation of Eileen's products. What is your favorite Eileen Hull die cut? This is the die that I started with. It's a little Suitcase, such a cute die. Makes a great party favor, big enough to hold a gift card, or . . . . . look what I made. 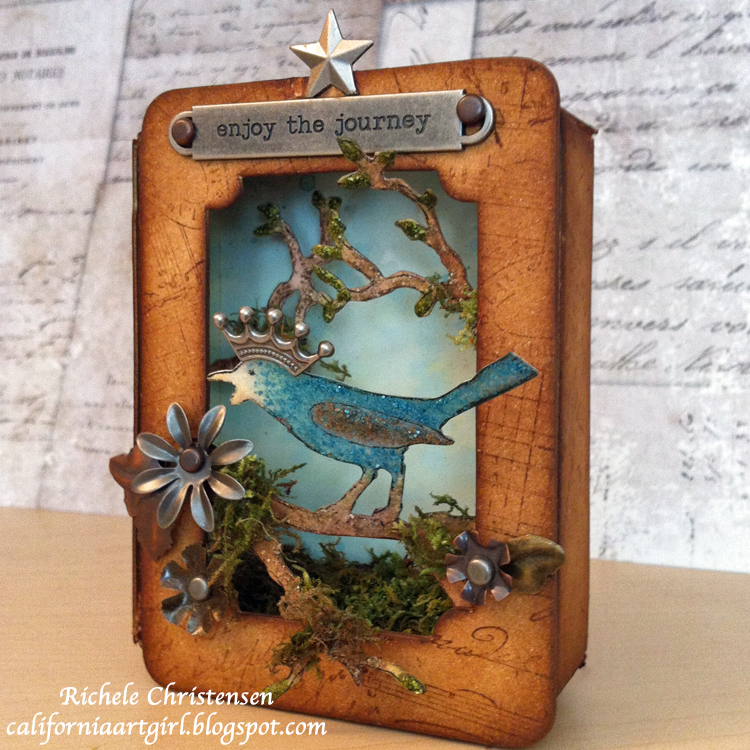 I die cut the Bird Branch (a Tim Holtz Bigz die) out of watercolor paper. 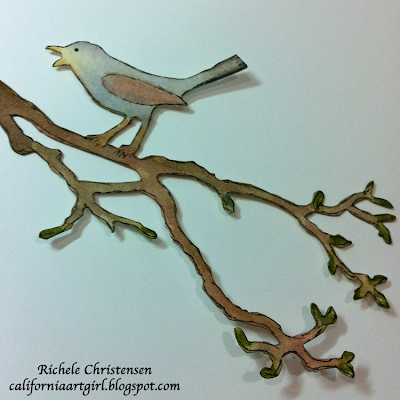 Paint the Bird and Branch using Distress Ink that is applied directly on my craft sheet and then pick up the ink using a water brush. I also used a fine tip black marker to outline the image. I die cut the Suitcase with my Vagabond using Little Sizzles white Mat Board. I used a crease pad to insure the scores came out correctly. Work on the inside of the box first. Color the background with Broken China and Mustard Seed using the large Water Brush and wash the background with color. Ink the edges of the box with Vintage Photo Distress Ink on an Ink Blending Tool. Now for the outside. Stamp the background with Vintage Photo Distress Ink and cover the entire outside of the box with a background image. 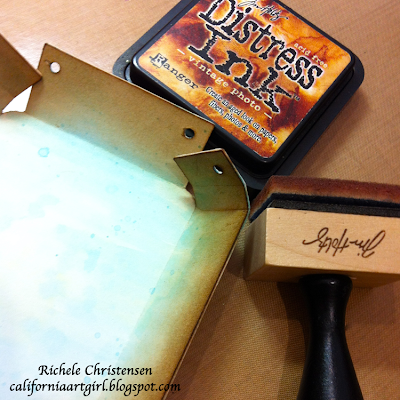 Ink the outside of the box with Vintage Photo Distress Ink on an Ink Blending Tool. Assemble the box by using Long Fasteners to secure the corners. 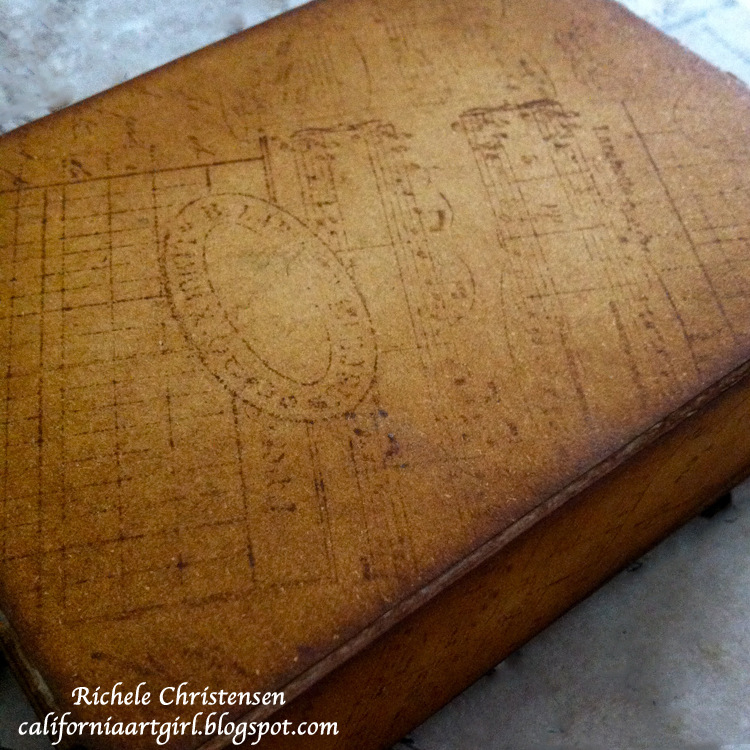 After the Suitcase body is assembled darken the edges with Vintage Photo on an Ink Blending Tool. Let's work on the lid. You will need to die cut a window before we go on, I used my Movers and Shapers Ticket die. Just center the Ticket in the lid and run it through your die cut machine. Stamp and Ink the lid as you did with the outside of the box. Now it's time to assemble your art piece. Glue the lid to the box using Wonder tape. Hold the bird branch up to the window in the lid and decide where to trim the branch. Adhere the bird in the window using pop dots. The branches that are cut off will be used at the top of the window. One branch is pop dotted to the lid and the other branch to the back of the box. Once all the pieces are adhered to your box add Distress Stickles to create a little sparkle. The colors I used are Frayed Burlap, Broken China, Peeled Paint and Rock Candy. Let dry. 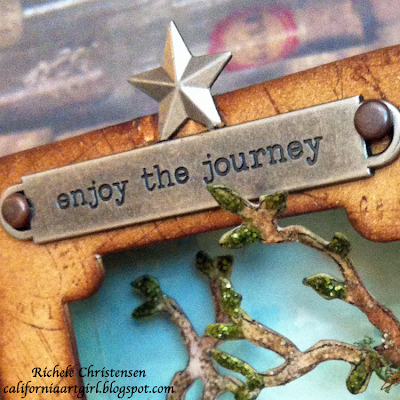 "Enjoy the journey" word band attached with long fasteners and a Star Charm glued at the top seem to be the perfect touch. 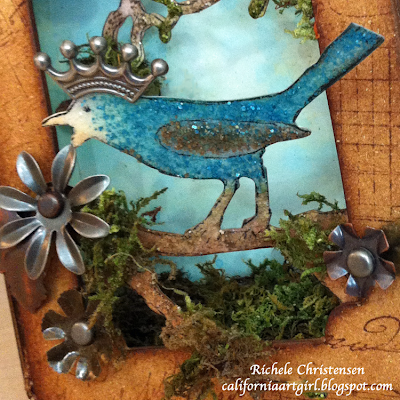 Add a Crown to the birdie and add some Foliage from the Ideaology line. A little moss adds a nice touch. Don't forget to head over to the Sizzix blog and check out what everyone made. I hear there is lots of fabulous projects!! What are you doing this weekend? 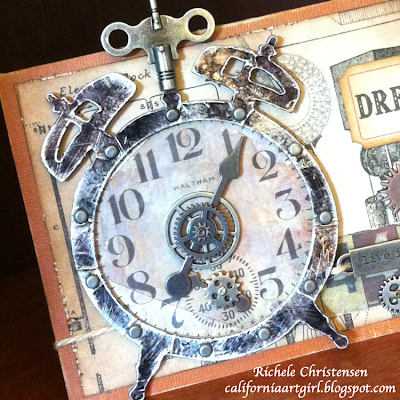 Are you getting in some creative time? Look at these fun new tags from Ranger. They are #10 manilla tags 4 1/4 x 8 1/2" of art surface. Ranger also has #12 tags and both sizes come in Black and Kraft too. I'm loving the new Summer Distress Inks, so bright and cheery and used with the Spring Distress colors is a match made in heaven. The background of the tag is done with Tim's wrinkle free distress technique. Apply your ink directly to your Craft Sheet, spritz with water until ringlets appear, swipe the tag through the ink, dry with a heat tool and repeat until you achieve the desired look. I colored the front of the tag with the Salty Ocean and a little Feathered Peacock. The back side of the tag that will be folded up was inked with Mowed Lawn. Once your tag is dry score a few inches up from the bottom to make your pocket. Stitch around the outside a few times with black thread for a cute border. 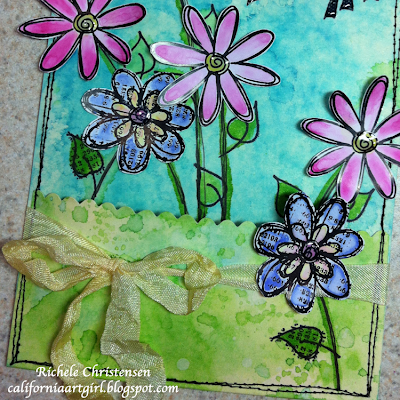 The flower stamps I used are from the lovely Dyan Reaveley the set is "How Does Your Garden Grow". The set also features some cute little birds. Stamp the flowers with Jet Black Archival Ink onto Specialty Stamping paper and then dry with a Heat Tool. Paint the flowers with Distress ink by applying the ink directly to your Craft Sheet then pick the ink up with your Detail Water Brush and paint your flowers. 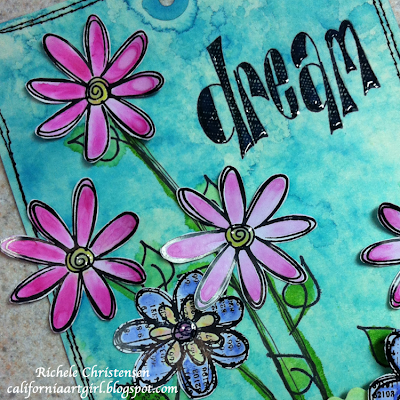 Once the flowers are dry, cut them out with scissors. 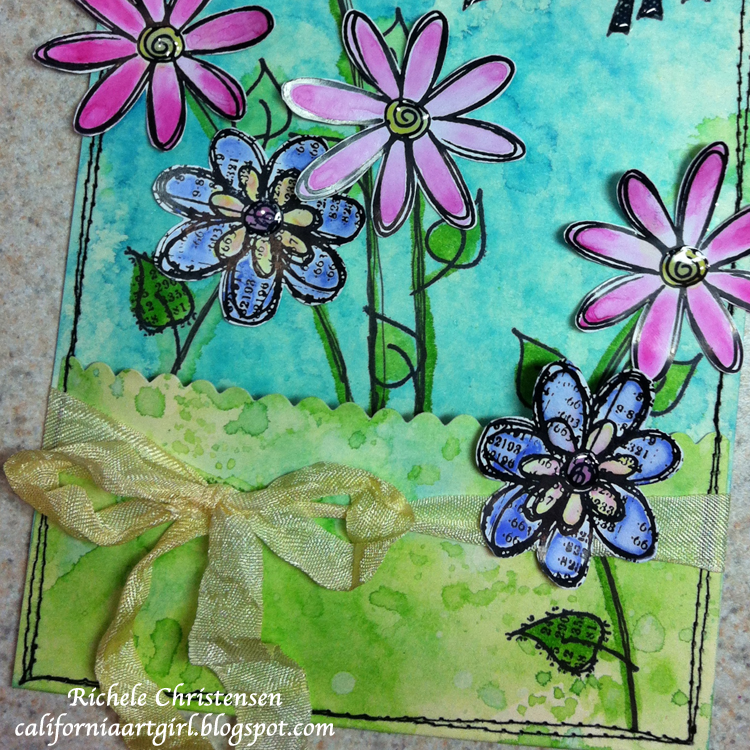 Stamp the stems and leaves for the flowers directly onto the tag with Jet Black Archival Ink and paint using the same technique as described above. Tie a ribbon around the bottom of the pocket with a bow. Pop dot the flowers to the tag. 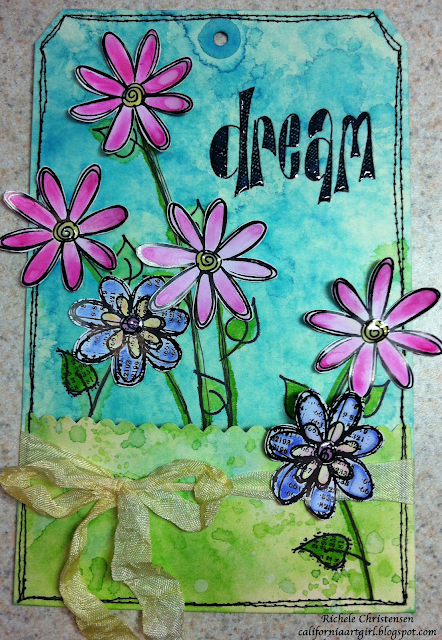 Add a little glossy accents to the centers of the flowers and the word Dream, set aside to dry. Tic Tock, time to Dream! I'm dreaming of all the new products coming out at CHA right now. The possibilities are endless. To start your dreamy card cut a piece of Kraft-core card stock to 6 1/4" x 9" score and fold in half. Cut a piece of decorative card stock to 5 3/4 x 4" and adhere to the base card. I sanded and inked the edges of the card. 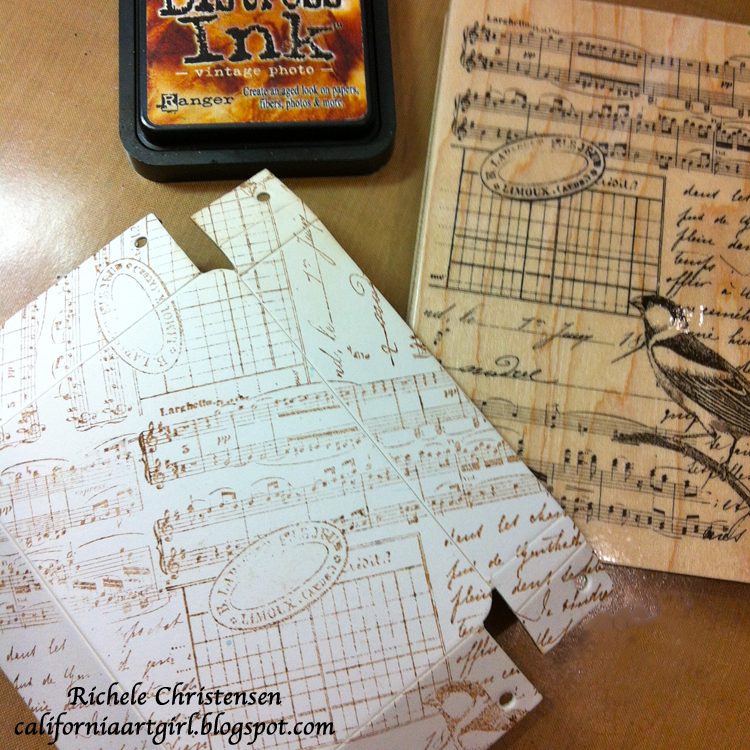 and of corse I inked the edges with Vintage Photo Distress Ink. The clock is Grunge Board covered with Ranger's Metal Foil Tape and then die cut with the Tic Tock Bigz die from the Tim Holtz Alterations line. 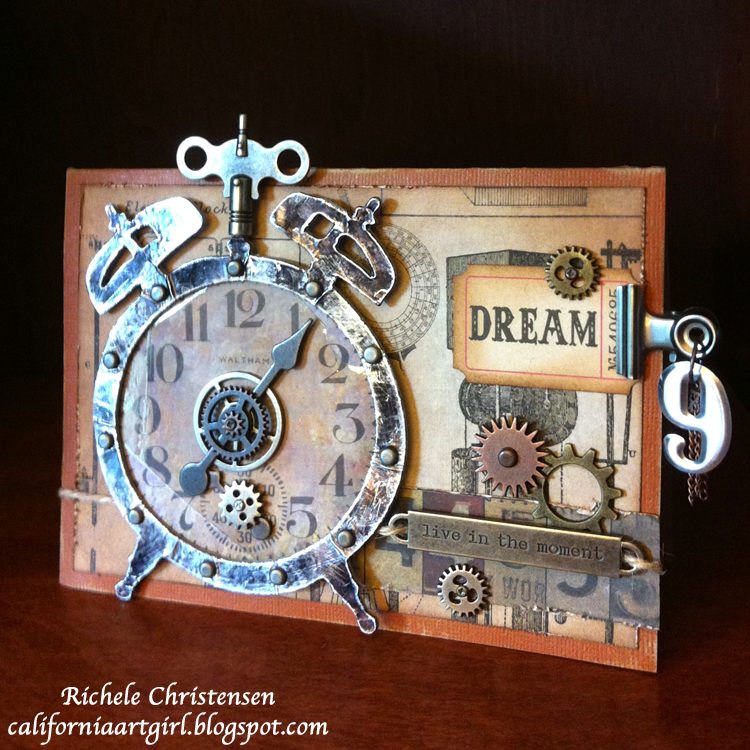 Alcohol ink the clock using Pitch Black Alcohol ink on an Ink Applicator Tool, sand the metal to create a vintage feel. Around the outside face of the clock I added Long Fasteners approximately 1" apart. To make the face of the clock Tim has designed the die to fit his Lost and Found Paper Stash Clock paper perfectly. I also added some mica over the clock face. As you can see in the photo it doesn't quit fit and that's okay. 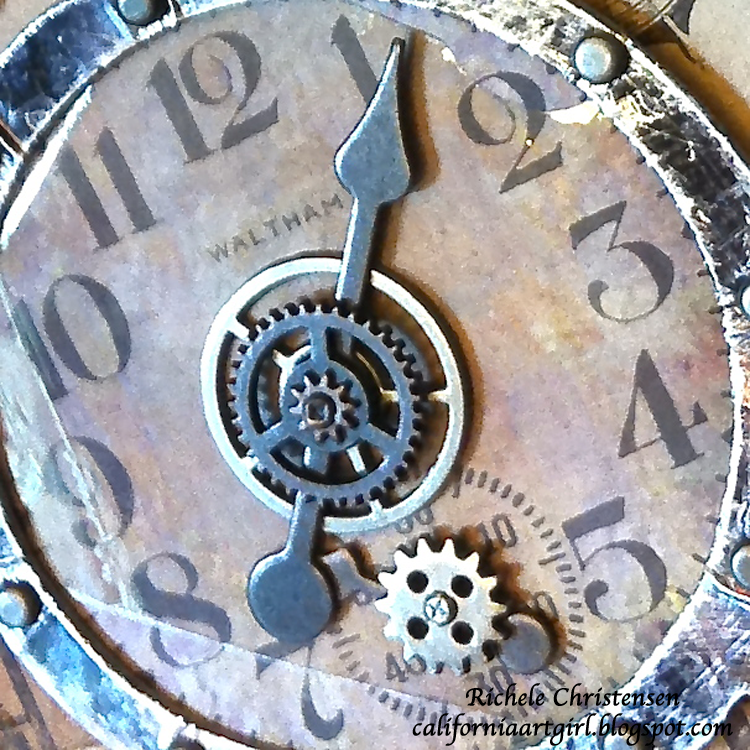 Mini Gears, Mini Fasteners, Sprocket Gear and Game Spinners area added to the clock to make it more realistic. 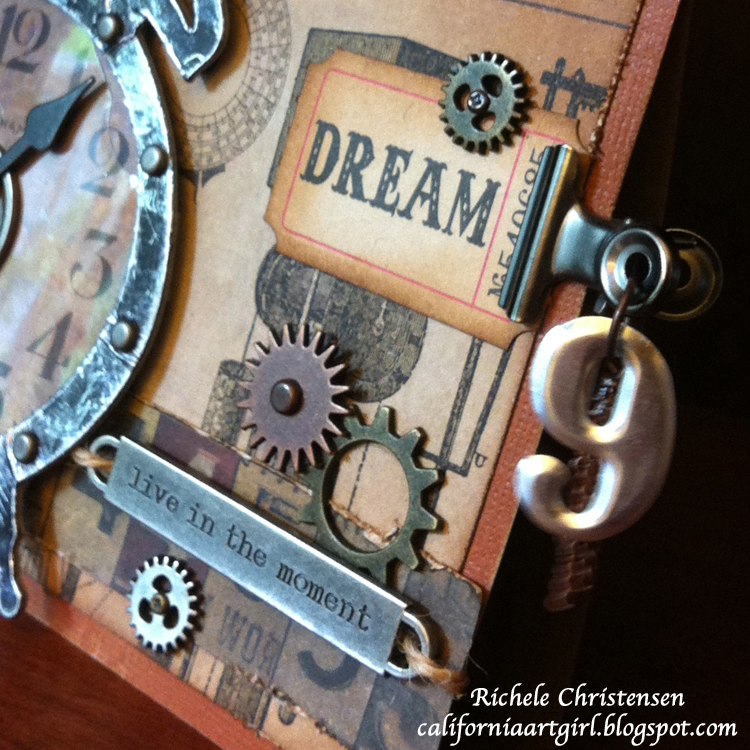 For the top, add a Clock Key so you can wind up your clock. I embellished the card using more Mini Gears, Mini Fasteners, Sprocket Gears, Long Fasteners, Hinge Clips, Chain Tassel and Mini Numerals. A Word Band was tied on with a piece of jute. Now you're ready to send your card to someone special.